Mike Ullery | Daily Call The Fletcher Fire Department corn maze is ready for visitors to the 2018 Fall Festival. The maze, depicting a fire engine, dump-and-go, and logo, is located at the department headquarters on State Route 589. FLETCHER — The frost is not quite on the pumpkins, but the Fletcher Volunteer Fire Department is ready to celebrate autumn. The department is gearing up for their annual Fall Festival, which begins Friday, Sept. 28, and continues every weekend through the end of October. On Saturday, Sept. 29, the festival will feature a hog roast, as well as games for kids. The following weekend, Oct. 6, the festivities will continue with a food truck rally, and on Oct. 13, a vendor show will take center stage. Fire officials are still accepting vendors for both the food truck rally and the vendor show. A car and truck show will headline the Oct. 20 weekend, with the Trunk or Treat and Haunted Corn Maze wrapping up the festival on Oct. 27. Festival hours will be Friday 6 p.m. to 11 p.m., and Saturday 2-10 p.m. Admission prices are $9 per person for those 13 and older; $6 for those 3-12; and children 2 and under are free. The Fletcher Volunteer Fire Department is located at 6605 State Route 589. The Fall Festival is sponsored in part by Fiebiger’s Seed Co.; B&B Ag-Vantages; Lena Ag Center, LLC; Ebberts Field Seeds, Inc.; Bensman Enterprises, LLC; and Plainview Farms. For more information on participating in or attending the Fall Festival, visit the Fletcher Volunteer Fire Department’s Facebook page. https://www.dailycall.com/wp-content/uploads/sites/30/2018/09/web1_091818mju_FFD_CornMaze1-2.jpgMike Ullery | Daily Call The Fletcher Fire Department corn maze is ready for visitors to the 2018 Fall Festival. 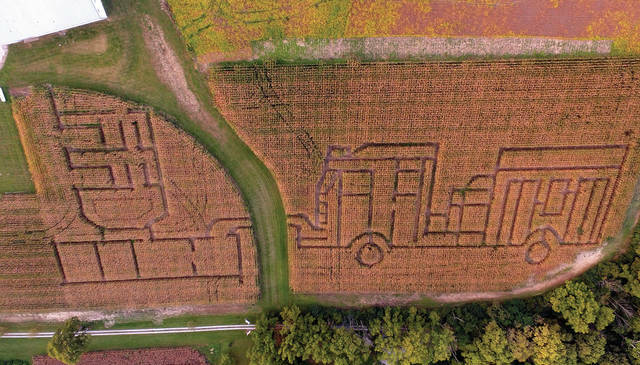 The maze, depicting a fire engine, dump-and-go, and logo, is located at the department headquarters on State Route 589.